Handi Quilter® is the leading manufacturer of quilting machines, computerized quilting systems, frames/tables and quilting accessories. HQ Pro-Stitcher was developed, written, and is supported by Handi Quilter engineers. The Pro-Stitcher Premium software is packed with features that enable you to resize, modify, and customize nearly any digital design available – and then quilt it with unparalleled precision. 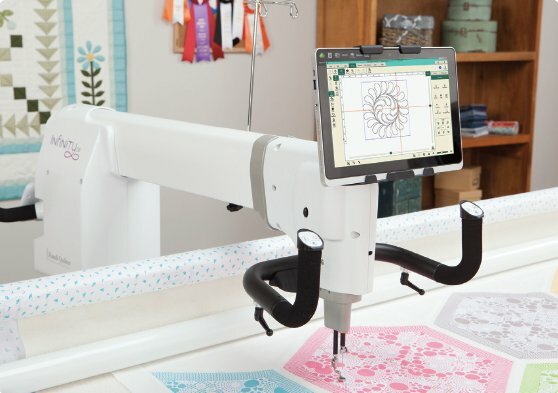 Easily operate HQ Pro-Stitcher from a lightweight touchscreen tablet computer that is conveniently mounted on top of the machine. You can be sure that you have purchased the highest quality product, which is backed by the HQ warranty and the largest network of local representatives. Expand your quilting possibilities with this easy-to-learn, easy-to-use, computerized system and have fun finishing more quilts!